Need a decent case to build your new PC in? Well, read on then. If you are thinking about building a new PC for yourself, the first thing that should be of concern is the case. Obviously one of the more integral parts for a system, a case should be selected with peace of mind so you don’t have to worry about replacing it at least a few years down the line. If you are on a budget it can be an arduous task of selecting a decent chassis. You might want to skimp out on your case and just pick up the cheapest one you can find, but you might regret that decision. You need a case that is well built and will not look out of place in your overall setup. With that being said, finding a case under $50 can be a tough task that is why this guide was created to help you with that. Let’s have a look at the best affordable cases you should be aware of. First up on our list is the renowned and well-respected company Fractal Design’s offering for their new budget case. 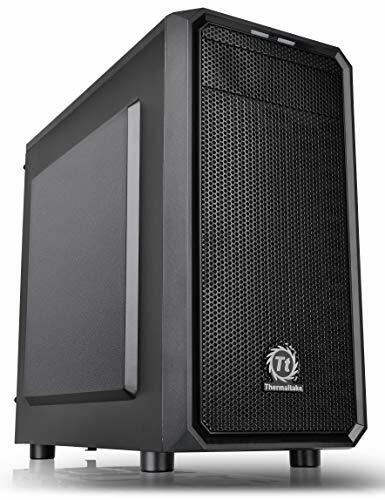 The fractal design Focus is a relatively slim and modern Mid Tower ATX chassis which is the best budget chassis found on the market. This case features a large side panel window and comes in either black or white. There are more colors in the Focus G lineup which retails at the same MSRP. It does not come with a power supply shroud and is a fairly conventional case overall. It comes equipped with two 120mm fractal design fans with the white LEDs. Overall the case in this simple white cover has a pretty minimal design with a black, sort of mesh, front panel which shows off the fans decently to give you a bit illumination from those white LEDs. It supports 6 case fans in total, 2 on the front, 1 on the rear and 2 up top. It does come with dust filters on the front top and on the base for the power supply which gives you a dust free interior. However, the price of this case fluctuates around our budget which is 50$. At the time of the review, this case was available at $54. It has great airflow support with up to a 280mm radiator on the front and also an option to mount a 240mm radiator on the top of the case. It comes with two drive bays to mount your SSDs and hard drives, and also comes with a 5.25″ bay for an optical drive. The front panel I/O is equipped with your traditional USB 2.0 port, headphone, and microphone jack and also is equipped with a USB 3.0 port. Overall the case comes with enough space for cable management and easy to build in. 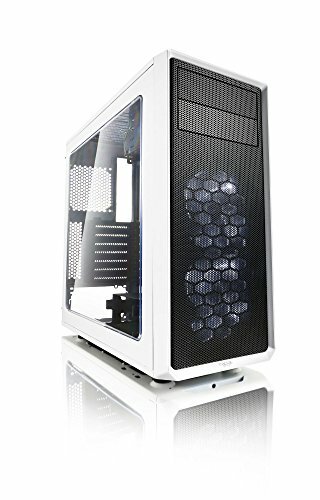 An easy option to recommend to anyone looking for a good case to last them a few years. Next up on our list is Thermaltake’s micro ATX offering, the Versa H18. This is a small form factor case with a bit dated but classic design. The front mesh panel looks great and the large side acrylic glass side panel complements that look. It also comes with a tempered glass version which is a bit more pricier. It has 4 total hidden drive bays, 2 for your hard drives and 2 for your SSDs. It comes included with a rear 120mm fan. Because it is a small form factor case, it supports the micro ATX and mini ITX motherboards. It comes with a power supply shroud which neatly hides your cables and has good cable management because it has routing holes placed in the appropriate positions. 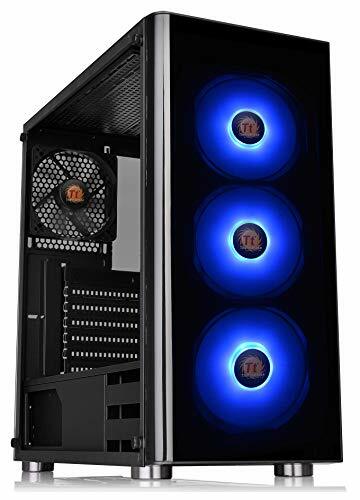 It has support for 5 case fans in total, 2 120mm fans on the rear and top respectively, and 280mm radiator support with the 3 case fans on the front. It has dust filters all around and overall, even though it is a small form factor case, it has a lot of breathing room and ample airflow. The front panel I/O includes the power button, 1 USB 3.0 Port, 2 USB 2.0 ports, headphone, and microphone jack, and LED switch. This is a tried and true classic Corsair case. It has a very generic no-nonsense design. 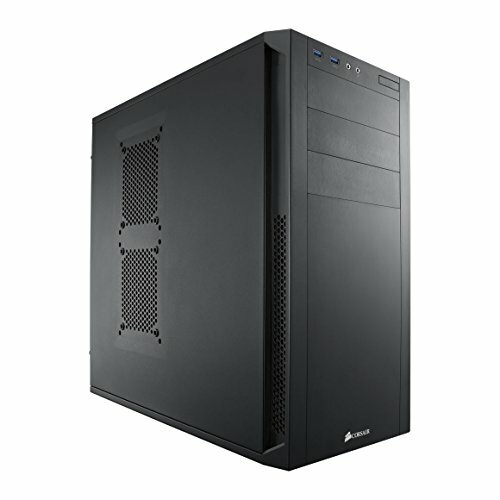 It has massive storage space for your hard drives and SSDs (up to 7 expansion slots). Great cable routing holes for cable management, support for up to 8 fans for ample airflow and enough room so that it is easy enough to build in. The front panel has 2 USB 3.0 ports and your audio jack for headsets and mics. It is a smaller micro ATX case which supports both mini ITX and Micro ATX motherboards. It is a good case for simpler builds but the thing holding it back is that you can still get better aesthetics at this price point and the radiator support is not that great in this case. This would be recommended to someone who doesn’t care about looks as much as the case lasting them for many years to come. Let’s just settle this straight out the gate, this is a really good looking case. It has a dark mirrored front panel that really isn’t transparent but looks really great with LED fans. The side panel window is acrylic and very large, it also has good visibility so you can see the internals of your case. The thing this case brings to the spotlight is the aesthetics. 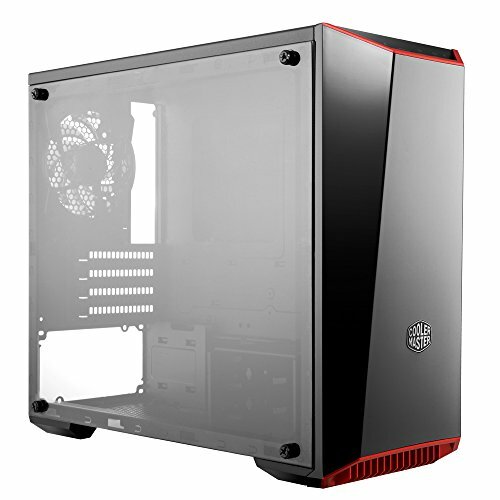 The red trim on this case looks really vibrant and this would look great in a black and red build. Unfortunately, this case seems to put form over function. As it does not have the best airflow or fan support. Cable management also seems to be a rather complex task in this case. It supports ATX, MATX, and mini ITX motherboards. Storage expansion includes space for 2 hard drives and 1 SSD, though there is a mounting option for an SSD on the front above the PSU shroud. The front can fit three 120mm fans or two 140mm fans. There is also room for a 120mm fan on the rear. Last up on our list is a mini ITX case from Thermaltake. This is aptly named the V1 cube as it very much looks like a small cube case. This is a very tiny ITX case and the only decent affordable one. It has a mesh design with grills all around. It has a large 200mm fan on the front and you can use a 140mm radiator with that. It can fit a graphics card up to 285mm which is very impressive for this small form factor. As for storage, it has two 2.5 inch drives and two 3.5 inch drives. Surprisingly this case has really good airflow and cooling. The build quality is pretty decent as well. Of course, this is not for beginner builders as this is a smaller case and a bit difficult to build in for newcomers. The cable management isn’t all that great either because of the limited space.